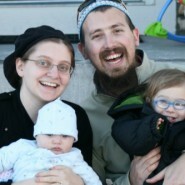 Over the 8 days of Chanukah, each day I will be featuring a different JewishMOM.com reader’s miracle story. After Chanukah, you will be able to vote for your favorite story in the JewishMOM.com Chanukah Miracle Festival, and the winner will receive $100. Enjoy! Our son Hallel was born with congenital cataracts and underwent surgery at age 3 months on both eyes and again at 4 months to remove a secondary cataract in his left eye. I could elaborate on the simple miracle of Hashem giving sight to the blind with the miracle of modern medicine, but that is not the story I want to tell. One of the possible complications of cataract surgery is glaucoma. Glaucoma is a degenerative disease of the optic nerve that is often related to, or caused by, high intra-ocular pressure (when the fluid in the eye does not drain enough and the pressure within the eye builds up). Because of this risk, Hallel’s pressure was checked as often as possible following his surgeries. Usually this is only possible under general anesthesia, but Hallel has always been very calm and tolerant, and he would allow the doctors to check his pressure with a portable Tonopen as I nursed him. Unfortunately, during the follow-ups after the surgeries, the results in the right eye were not reassuring. Since the second surgery we were administering a whole cocktail of drops to try and lower the pressure; we also cut out all the steroids we were giving him to reduce the risk of inflammation. I don’t remember exactly, but I think it was four different types of drops in various combinations, four times a day. Nothing seemed to be helping and the pressure was still worryingly high in that eye. The doctors were becoming more and more concerned, and the cloud of another surgery, far more complicated than the past three, hung over our heads. Eventually, our doctors told us that we would need to see a certain specialist, Israel’s leading expert in glaucoma at a hospital in Haifa, in order to consult about the possibility of surgery. During the months before that I had been living in a kind of blur of denial, resistance, loneliness and desperation; I was hanging on hopelessly to the proverbial light at the end of the tunnel, telling myself this would all be over in a few years and Hallel would never remember a thing. When the threat of this other surgery and its complications grew closer, I found myself living in great fear of what it would do to me. How could I possibly handle this? How would we live with the repercussions? What if one of these procedures ended up blinding him for good? As I sat in the car with my son sleeping blissfully in the back seat, tears streamed down my face as I realized that he and I were not helpless victims of our circumstances. When Hallel was in Shamayim before he was born, Hashem had shown him everything. He had shown him the three months of blindness, the surgeries, the endless checkups; shown him the future that is still unknown to me. He showed him me, the timid woman who could hardly bring herself to order a pizza, much less advocate for herself or someone else in a medical setting, but with a heart full of love and longing for him. God showed him all this and He asked my son, “Do you want this?” And Hallel said yes. Hallel chose me. And I chose him, I chose this life and these challenges, and Hashem chose us for them because He knows that we are capable of overcoming them. He knows that we have strength that we could never imagine. I knew this surgery would have to take place. I was completely resigned to that reality. But for once, there was no fear. I knew that we would endure this, and that everything would be fine. I knew that we were strong, stronger than we could know. I had total faith in Hashem that this is what I was meant to do in the world and I was ready to take His hand and rise to the challenge I knew He wouldn’t have set before me if He knew I couldn’t do it. I was filled with a sense of faith and acceptance and this feeling of ultimate kindness from Hashem, like He was right there with me, lovingly guiding me down this path. A few days later, we packed into the car early in the morning–my husband, Hallel, and me–and we began the three-hour drive to Haifa. It was a beautiful winter day; the Carmel mountains glistened green from the recent rainfalls, and the sun streamed out from behind white fluffy clouds floating in a deep blue sky. We opened the windows and breathed in the damp air, determined to enjoy as much as we could from what could otherwise have been a very stressful trip. We arrived at the hospital and signed in. The professor is not a clinical doctor, but rather the head of the department, so she saw us in between surgeries and visits with patients. We had to wait a very long time, both to see her and for Hallel’s pupils to dilate sufficiently for the examination. As we drove home, totally drunk on our enormous good fortune, I thought about nisyonot (Divine “tests”). I used to think of a nisayon as a very difficult thing, like a test at school. As the way we experience God’s din, the attribute of justice. But as we drove home I realized that that is not true. Nisyonot can be pure chesed, mercy and kindness. It was as if Hashem had set this before me just to show me how much faith and strength I have. I was ready to accept this challenge with love and acceptance. And maybe, in His enormous mercy, because I had risen so well to the occasion, He did an additional and unbelievable chesed with me, and erased the entire nisayon as if it had never existed right before my eyes. Not long ago, we stopped my son’s treatment with Cosopt in light of his excellent results in all the examinations that followed. 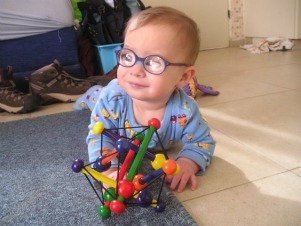 We continue to pray that in the near future, Hashem will complete the miracle of my son’s darkness turned into light; that his pressure will always be normal, that his eyes will grow enough to allow the implantation of the artificial lenses soon. That Hallel ben Daniella Naomi will be zocheh to read from the Torah scroll for his bar mitzvah and see every letter clearly in all its beauty and meaning. That he should have clear vision for the rest of his life, physically and spiritually; that the world should always be stunningly beautiful to him; and that he should always see everyone and everything with an ayin tovah. Daniella Levy is a JewishMOM to two toddlers; a self-defense instructor for women and children; a translator and a writer. She lives in Tekoa in Gush Etzion. Another amazing miracle story. I got goose bumps reading this. Thanks for sharing. This a great story, beautiful. When I read at the bottom that she’s a writer, I wondered if this contest is fair! If you write something really well, the miracle may move people more than the other ones! How does one measure the value of a miracle? By the sheer odds? By the impact it had on the receiver’s life? By the sorrow and suffering that proceeded it or that it prevented? Why bother trying! Every little miracle should be like the splitting of the Red Sea to us. 🙂 Hodu l’Hashem ki tov! I think people will vote on what moved them the most, made them cry…. though it’s too late, I don’t agree at all. A miracle is a miracle: and Hashem will decide who’s miracle should win…. all so beautiful, you are all of course winners. voting will definitely be difficult! but daniella i am so much crying at your story of emuna and love! so much love for this little son and for Hashem, so much emuna! it is in eretz israel that we find such great people! Daniella, thank you for your story. Is it possible to ask you the name of the leading glaucoma doctor in HAIFA you referred to? Is she a child eye doctor or a general eye doctor? Thank you in advance and best wishes for the holidays! This story was tremendously moving and made me cry. You write beautifully! I also received chizuk from the way you dealt with your challenge. WOW!! This story is soo beutifully written and gave me such chizuk!! Amain! He should have a refuah shelaima! thank you for sharing! beautiful! and you don’t sound timid at all…self defense instructor living in tekoa! I have 2 children who were born with congenital cataracts. Boruch Hashem they both had surgery and see well. My older one had his bar mitzvah in August. May your Hallel grow up and be zoche to see well, to learn & be a talmid chochom & yerai shamayim. Hatzlocha!